Smoothly poured, and smoothly swallowed, this delicate chocolate drink danced in daylight, a creamy delight, as if to tease me, please me into a heightened awareness of all that is succulent and good. And, mmm, it was and is good, this chocolate Slim Fast. We spent a weekend in the fields. I shook the cans, one at a time, completely as their humble label directed. Their cardboard box was sturdy enough only to sit upon the ground and watch the clouds go by, but in this, I was content. 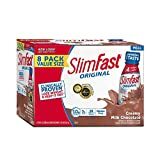 Just sipping Slim Fast in its 190 glorious calories, that was enough pleasure for me. Always cool, cold–chilled in my refrigerator for a fortnight, the flavors were at their peak. One night would’ve done well, but 14 sufficed beyond chronological measure. Each of the 24 vitamins and minerals sang out to me, called me their friend, and I called them friend. Calcium was there, ready to drink, ready to nourish. We, the Slim Fast and I, drank together through the weekend, until the sunset, and then, when the sixth can was empty, I slumped into a satisfied grin. This is the way good days are spent, drinking Slim Fast. May yours bring you the same chocolate-flavored happiness. More food love. More romance.